A new organisation promoting independent mental health advocacy (IMHA) quality and access has called on the Health Secretary to guarantee good quality advocacy for all inpatients of mental health services receiving treatment in England by the end of 2015. 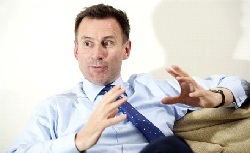 In a letter to the Secretary of State for Health, Jeremy Hunt (pictured), and the Minister of State for Care and Support, Alistair Burt, the IMHA Society says that since their introduction in 2008 there has been, and there continues to be, a "wide variability" in the quality of IMHA services nationally. The group suggests that "good quality IMHA services have demonstrated their value in empowering patients, leading to better recovery while the opposite is true of poor quality IMHA services, which can make a patient feel even more isolated and disempowered". IMHA was introduced by a change to the Mental Health Act in 2008 and was subject to a Health Select Committee report in 2013. However, despite the recommendations of the Committee, not all inpatients of mental health services receiving treatment have a legal right to access IMHA, including patients who have not consented to treatment.  Agree that legislation will be changed urgently, so that patients in England subject to the Mental Health Act will receive the same level of IMHA support as patients in Wales.  Ensure all inpatients of mental health services receiving treatment in England, including all those who have been detained under the Mental Health Act are provided with access to good quality IMHA services by 2015.  Increase the number of IMHA services available from 2015 to help almost 30,000 people being sectioned annually, often being detained more than once in a year.  Work with IMHA Society, as the originator and initiator of these requested reforms, to deliver definitive statutory guidance, clear and robust national regulations and quality training standards for IMHAs in 2015, to enable consistent quality provision of empowering IMHA services nationally. The reforms proposed are supported by a range of leading mental health experts including Professor Richard Jones (Author of the Mental Health Act Manual and the Mental Capacity Manual), Professor Kamaldeep Bhui (President of WACP and Public Health Lead of the Royal College of Psychiatrists), Aswini Weereratne QC (Doughty Street Chambers), Alex Ruck-Keene (39 Essex Chambers), Professor Phil Fennell (Professor of Law, Cardiff Law School, Cardiff University), and Sir Mark Hedley (Retired Judge of the Court of Protection and Visiting Professor, Liverpool Hope University). To find out more visit www.imhasociety.org.